An esbat is a ritual that is related to the practice of the Wicca religion. Wicca is a modern, pagan religion previously referred to as witchcraft. The name Wicca was first introduced in the 1950s by an English anthropologist and archeologist named Gerald Broussea Gardner. Wiccan practitioners do not acknowledge a central authority and therefore there is a varied interpretation of how Wicca is defined. A universal agreement across denominations is that Wicca is a pagan form of religious practice that focuses on the natural world for its belief system. Wicca is primarily a duotheistic religion, worshiping two gods, one representing feminine and the other representing masculine. Most Wiccans believe in magic, a force that can manipulate nature through witchcraft, sorcery or spells. A Wiccan code of morality states that you should do no harm to others through magic and if you do you will suffer negative consequences. Belief in an afterlife among Wiccans includes reincarnation of the human soul which returns to Earth to learn and advance the spiritual self. Wicca is based in natural elements and many traditional Wiccans hold the five classical elements of spirit, water, air, earth and fire in high regard. Natural cycles play a major role in Wiccan rituals and ceremonies and often coincide with phases of the moon and changing of the seasons. Esbats are ritual observances that occur in conjunction with phases of the moon. Unlike the more formal Sabbats, celebrations of the equinoxes and solstices, esbats are less formal meetings of a coven, or group of Wiccans. Some Wiccan denominations prefer to hold esbats during the full moon but esbats can be observed during any phase of the moon. There is an esbat for each full moon so Wiccans observe 12 esbats a year. Some practitioners observe a thirteenth esbat in observation of the blue moon. A blue moon is the occurrence of a second full moon within a one month period. 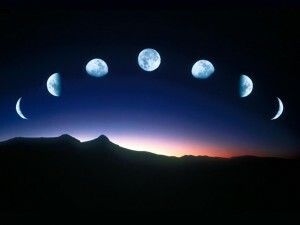 The reason a blue moon occurs is due to the natural lunar cycle which takes an average of 28 days. Approximately every 28 lunar cycles extra days accumulate because the Roman calendar is longer than then the natural cycles. When enough days have accumulated a blue moon is observed.